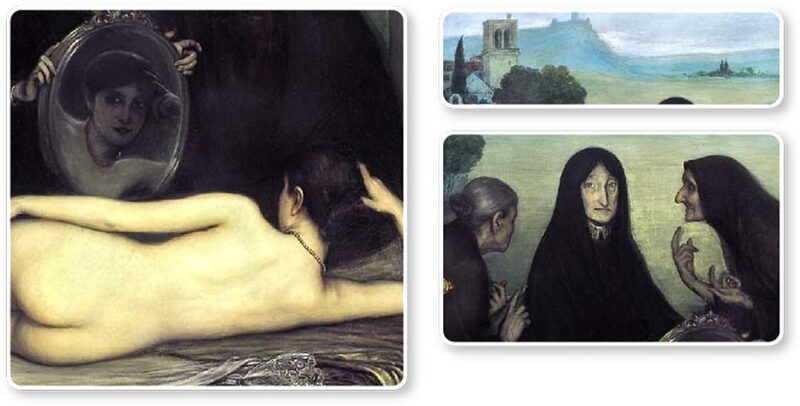 The Sin and Two Paths, triptych by Julio Romero de Torres, ca. 1906. The symbolism of these three panels is complex and fascinating. The top right is a view, at sunset, of a church (Saint Hipólito in Córdoba) in the foreground and a great Spanish castle in the background. 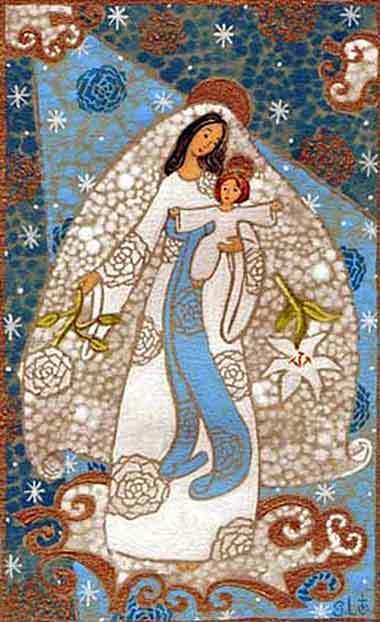 La Vierge (the Virgin), tapestry by “Cathy S.”, contemporary. Having defined Hagar and Ishmael as a symbol of the Law, and tying them to “the now Jerusalem,” Paul introduces something called “above Jerusalem” which he ties to “our mother.” He then returns his attention to Hagar, quoting a bit of slightly unsettling Scripture. The passage is difficult; we have tried to iron it out a bit in the paraphrase “Daily Prayer Bible” version. He differentiates between two Jerusalems, the Jerusalem that is tied to the Law — and thus to Hagar, Ishmael, and the desert — with the attributive adverb “now.” Greek uses adverbs (as does English) as adjectives, which sounds fine with a “verbal” noun. Look at this sentence: “We will give our alms to the badly treated.” “Treated” is a verbal noun, meaning simply that there is a verbal idea in it (and in fact it is the past participle of “to treat”). “Badly” is an adverb, but since it modifies a noun, we have to call it an adjective. Jerusalem is not a verbal noun, but Paul uses an adverb — “now” — to describe it. Again, we also do this in English when we must, but when we do it, there is always an inherent idea of change. We might “the then-President” and might even say “the now-President”, which are awkward expressions, but they get the point across; the speaker wants to emphasize that things did (or will) change, that the person's presidency is or was temporary. So when Paul says “the now Jerusalem,” he is undoubtedly anticipating that there will be another Jerusalem, or that the character of Jerusalem will change fundamentally in the future. Then he throws us a curve ball. Instead of comparing Sarah to the “new”, or “coming”, or “then” (used in the future sense - see 1 Corinthians 13), he uses another adverb, “above”. As in English, the basic meaning of “above” can be extended to an abstract sense of superiority, in almost any way: The rank aboveUsing the preposition “above” instead of the adverb, because it's easier to think of short examples. captain is major; the Joneses acted like they were above eating catfish. So the Jerusalem of Sarah might actually be “above” the Jerusalem of earth: it could exist in heaven; but more strongly, we get a sense that there is a Better Jerusalem than the one we see now. If you have read Revelation, you might remember that the term New Jerusalem is used for the City of God: “And I saw the holy city, new Jerusalem, coming down out of heaven from God, prepared as a bride adorned for her husband.” (Revelation 21:2) And there are theologians who will claim that Christ in heaven already inhabits the New Jerusalem. But Paul is talking more abstractly here than is John the Divine in Revelation. He has drawn an allegory of two worlds, the world of slavery with a very real but also symbolic center in Jerusalem, and the world of freedom, with its center in a place superior to Jerusalem. We can see Paul's “above-Jerusalem” as an actual place or as an abstract concept — it doesn't matter. What matters is to see that part of the impact Christ had upon us, was that Isaac was ultimately shown to be, not the patriarch of Judaism, but the patriarch of Christianity. While Ishmael, who was the patriarch of a Gentile nation, became in essence one of the enslaved, the same as a Jew who continued to embrace the Law as the means to righteousness. So when Paul said earlier, “In Christ there is neither Jew nor Gentile,” this is part of his meaning. It is not that Jews and Gentiles have become equivalent and equal; the distinction simply ceased to exist in the eyes of God. Matthew 28:19-20: Go therefore and make disciples of all nations, baptizing them in the name of the Father and of the Son and of the Holy Spirit, teaching them to observe all that I have commanded you.